Regionalisation analyses are used to classify the environments across a region into a number of discrete classes, thereby providing a spatial and environmental subdivision of the study area. The classification is made on the basis of a number of environmental datasets, thereby providing an integrated description of the types of habitats characterised by those data. These types of analyses are typically undertaken as part of spatial management and modelling activities. 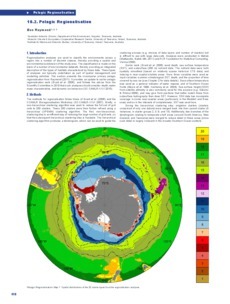 This section presents the circumpolar primary pelagic regionalisation from Raymond (2011). It provides an update to earlier pelagic regionalisation work (Grant et al. 2006), and follows the advice from the Scientific Committee in 2010 that such analyses should consider depth, water mass characteristics, and dynamic ice behaviour (SC-CAMLR-XXIX 2010).